Tailored elaborately to protect your camera against damage, dust and scratches with its waterproof exterior and its soft anti-shock interior. Made from weather resistant nylon with tough reinforced stitching for everyday carry. 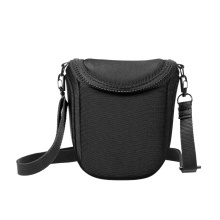 Specially designed for compact cameras, slim and chic. Adjustable and removable shoulder belts for crossbody or shoulder wear. One extra pocket inside for accessories, provide added protection when not in use. Compatible with most compact system, keeps your camera stored safely inside.